Just regular folks. : Jeremy and a rusty iguana. Jeremy and a rusty iguana. 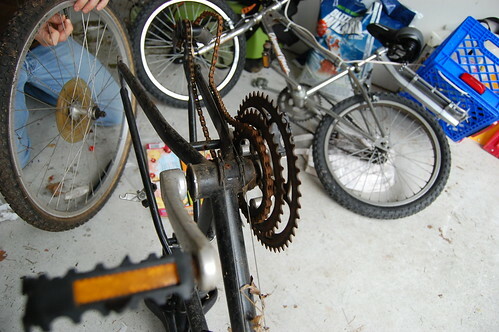 Jeremy got a rusty old bike for free from our next-door neighbor. He's having a fun time trying to rehabilitate the whole thing. 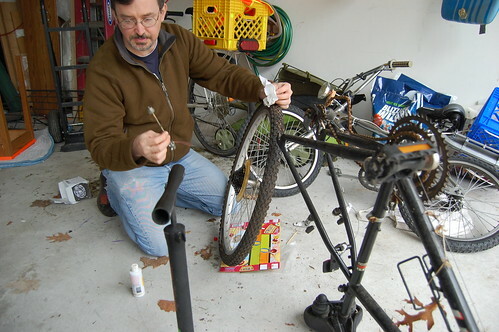 I think it's going to end up being my bike, perhaps replacing the trusty BMX bike that I've been riding. I love my BMX bike, I look so ridiculous riding it to the Metro - I get a lot of perverse pleasure from it. Jeremy's been trying to find a better bike for me, but I would not agree to spending a lot of money on a new bike that might get stolen from the bike racks. I think a rusty bike (it's a Giant Iguana) is a good compromise. Back aches and plugged ears.